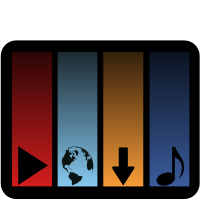 Download, play, rip or convert to Ogg media from various Youtube-like sites. Having recent problems with Youtube? Get media from various websites! Youtube and other popular video sharing websites are supported in WatchVideo through GetMediumUrl. 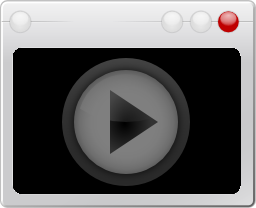 You can choose the format of the video you want to get from the available formats. By default WatchVideo asks for the format of each video. But you can configure it to download in the highest or lowest format (quality) for any video or for videos from a particular website. Despite the name, WatchVideo is also able to download videos to any directory you like. You can have simultaneous downloads, each with a couple of available actions, like copy the original link, open the containing folder, amongst others. You can also play the downloaded file by double-clicking the download. If you use the Add Videos button you can specify some action to be executed when the download finishes, like converting to Ogg, extracting the audio or specify a new directory to save the video. You can play media directly in WatchVideo through the built-in player. In case you don't have the necessary libraries for it or you don't like using it, you can use any external player you prefer. By default, your default player is set as WatchVideo's external player. The built-in player in WatchVideo was created with mind set on playing online media. It has a double bar like most online players. One for playing and other underneath to show the download progress. It has an auto-hidden playlist on the right side, where you can see the download progress of each video and also their titles in a scrolling text way, so it's easy to see and doesn't take much space. It also features a repeat button that can repeat just a track, the entire playlist or not repeat anything. There's also a Youtube search which can be easily shown/hidden by ticking/unticking the option at View->Search. You can play a Youtube video from the search by double-clicking it or you can right click it to download or copy the link to a friend. WatchVideo can also be used as a command-line tool. Although all files are provided in the same package (at least for now) you don't need the GUI dependencies to run just the command-line version. WatchVideo by default sends notifications when a download finishes or when some error with a download occurs. It can use the system's notification mechanism if python-notify is installed. Or in case it's not installed it uses tooltip ballons provided by Qt. WatchVideo was created with the purpose of avoiding the need of the proprietary Adobe Flash to watch videos on the web. 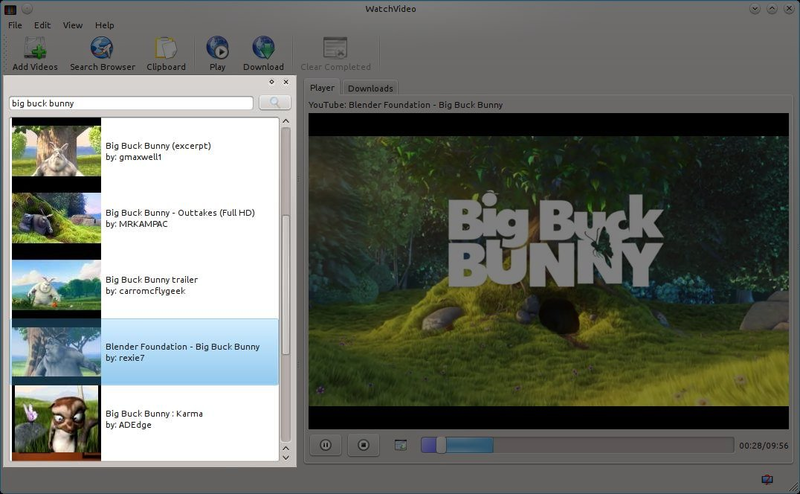 WatchVideo is Free Software under the AGPL v3. This site is licensed under CC BY-SA. Some icons may have a different license. Here's the list of icons: VLC, Youtube, Python, Flash, Chakra, Archlinux and Oxygen.